That's what I am tonight. I stamped, I stamped again. I paper-pieced and fussy cut. I used several different dps and glitter papers. I colored with my Copics. I layered and layered my card base and mounted my image on cs. I die cut and die cut and die cut. After putting all the base pieces together, I went to add my main Pure Innocence image for the MFT challenge, and guess what? I couldn't find it. So tonight I am joining the challenge at CAS - Colours and Sketches. I don't think I have played there before, so it is nice to find a sketch there and join in. This is a great quote from John Lennon put into a stamp by Paula Best. I used KaiserCraft Lilac Avenue dp and DCWV cs. Ribbon is from SU! and I added Swarovskis to the image which is stamped with Versafine Imperial Purple. Wish me luck in locating my lost PI girl! Beautiful card!! I love the colors and the quote!!! Great job on this one, Kathleen. I love it! Thanks for sharing with us this week. Thanks for joinig us at JIC! That happens to me all the time...someday I will get myself organized. 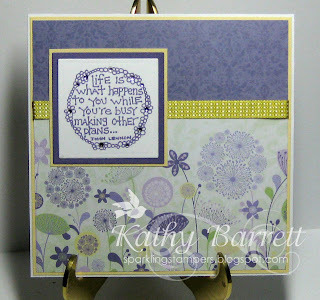 Thanks for sharing at Loves Rubberstamps with your lovely card.